With the large swathes of properties rising by the Thames in East and South East London and the potent effect of the Elizabeth Line rail network on housing, this is an exciting time for new residences in London. And so, with everything from spellbinding views of the Thames and docks to ingenious adaptations of iconic buildings, here are five residential developments to set your heart racing. Greenwich Peninsula bills itself as “London’s Emerging Cultural District”—indeed, they are not doing things by halves. 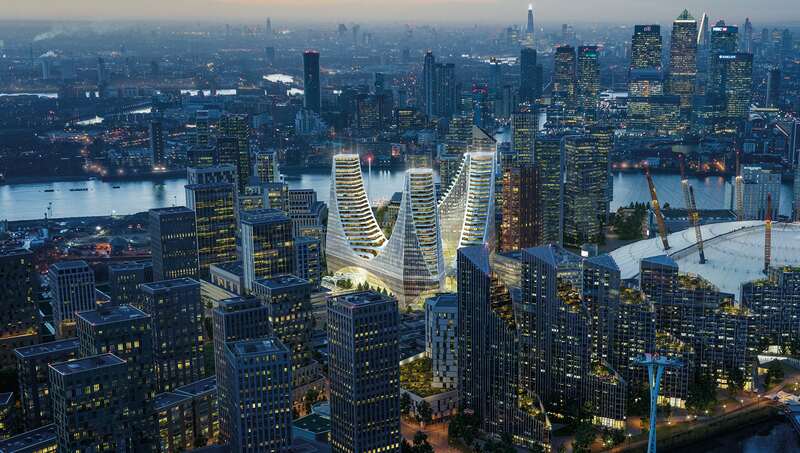 Riverside bars and boutiques, winter gardens, a 5km sculptural running trail, and a Film District are just part of the vision for this Thames-side South East London regeneration project. The scope of new residences—over 15,700 in all—is dazzling, too. While all the homes in the leafy Cable & Roper buildings have been snapped up, apartments are still available in the quintet of river-facing prisms at No. 1 & No. 2 Upper Riverside, designed by the architects behind the New World Trade Center. Neighboring Maritime Greenwich might have been a desirable location for decades, but North Greenwich’s ship has just come in. Do not adjust your set: the world-renowned BBC Television Centre, where the likes of Monty Python’s Flying Circus and Fawlty Towers were shot, has been transformed into luxury West London residences. Apartments here are brand-new (in The Crescent, which boasts garden and/or park views) or repurposed from the old building (The Helios, touted as a midcentury modern masterpiece). Three of the historic studios are set to reopen for filming, too, which means you can abandon your TV and watch the live action instead. It has been impossible to ignore the 50-story One Blackfriars as it looms over the south side of the Thames in Central London. 274 light-flooded apartments are part of the instantly iconic design from SimpsonHaugh Architects. (It’s already been nicknamed “The Boomerang,” and you know you’ve made it as a skyscraper in London when you’ve got a nickname.) The real selling point, of course, is the panoramic views. Lucky residents will be able to spy everything from Shakespeare’s Globe to St Paul’s Cathedral and The Shard. Ealing in West London may not typically be considered well-connected to the center of the city, but that’s all changing now. The long-anticipated Elizabeth Line will stop right on the doorstep as of 2019, and Night Tube services are already running here on the weekend, so Ealing is turning into an in-demand hub. While the Elizabeth Apartments come with underfloor heating and Siemens appliances, the Vista Penthouses include marble-finished bathrooms and terraces with far-reaching views. And don’t forget— much of this area of London remains low-rise. As the erstwhile industrial Docklands and Isle of Dogs transform into residential hubs, there are some truly tempting properties coming onto the market. One such place is Dollar Bay—a collection of high-rise apartments and penthouses positioned on the placid waters of South Quay—with some mesmerizing views of the Canary Wharf financial district and beyond. The ripple-fronted building even comes with its own winter garden, which is particularly welcoming on gray days.